It seems the best things in life are reserved for the starlets and the 1%. Invite-only parties, G5 private jets, tax breaks and private islands. Well, move over fat cats of Wall Street because there’s one private island out there that anyone can enjoy and that is Ratua. If you’re looking for a beach vacation that does not include Hawaiian-shirt clad retirees or screaming children throwing volleyballs at your head, then consider an escape to Ratua. 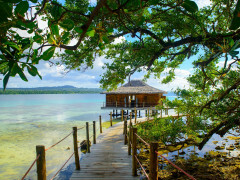 What Makes Ratua Private Island Special? Located in the Southern Pacific Ocean off the coast of Australia, Ratua is surrounded by 146 acres of lush tropical jungles and clear, turquoise waters. Unlike many places on earth, Ratua is an island that still has ample places left to explore. Whether you roam the island by horseback, mountain bike or foot, you can snorkel, fish, hike and explore the many underwater caves and natural pools scattered amongst the verdant jungle. 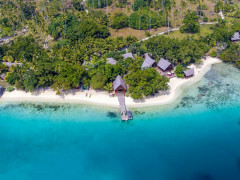 Before you imagine yourself looking like Tom Hanks in Castaway on a deserted island, know that Ratua is home to luxury, private villas with prices that offer modern amenities, spas and services. A beach getaway with peace and tranquillity. Untouched lush natural beauty and unexplored jungle.